Growing up in NJ, it is almost a given that you will hear and joke about the New Jersey Devil. My brother used to joke when we would play in our backyard, which is mostly woods, that we were going to see him. I never completely understood the story behind this tale, but when I first arrived at Stockton I heard more jokes about being so close to the Pine Barrens and that I was bound to see him at some point. 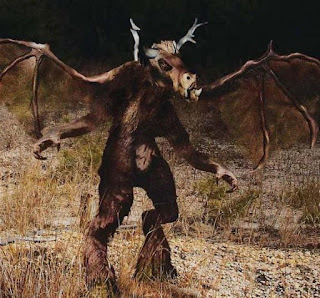 This lecture helped me understand what started this tale, who the NJ Devil actually was, and some cool stories about sightings. The NJ Devil is actually surnamed Leeds (I keep thinking of Jimmie Leeds Road). He was cursed before birth, and appears with haunting, piercing screams. The stories about the sightings are what interest me the most. How can so many people be making up the exact same situations and scenarios? Also fun fact, the New Jersey Devils hockey teamed is named after him! Who knew? Here is a link to an interesting video regarding a sighting. I actually had no idea who he was before going to Stockton either. I didn't think it was such a serious legend until taking this class. The descriptions and depictions of the Jersey Devil are terrifying. The history behind the tale is fascinating as well. Doesn't this legend scare you? It freaks me out a lot. Either the person who thought to make up this creature is very creative and unusual in the mind or hes real. I personally would not sit there and make up a creature with a whole background to it. I am also not that creative when it comes to fantasy.